Good Morning Everyone! I know I told you a few weeks ago that I was going to be ordering some products and..........Karen's Body Beautiful is the business! For starters, her customer service is on POINT! I called and was able to talk to Karen. She is a very helpful and professional lady. She assisted in helping me pick the products best suited for my hair based on my description of my hair. By the way check her out on twitter (@karensbeautiful) and check out her fro!! That's what I want in a few years!! Gorgeous!!! I know, you are wondering why I ordered an entire regimen. Check out my last post. I ordered the Juicy Shampoo Bar, Deep Conditioner, and the Hair Milk all in the Lavender Vanilla scent except the Shampoo Bar (which it smells good too!). The Shampoo Bar lathered! Bubble galore ladies! I'm not kidding AND it did not take much either. This shampoo bar is going to last a LONG time. It's worth the $12 and you get 2 pieces. Think about it this way, it's great for the environment (no bottles) and it saves space. Also, great for travel because you do not have to worry about spills over your precious garments! The Deep Conditioner was a treat during detangling for my hair! Made my hair soooo soft and it smelled really sweet too! I let it "marinate" for about 20 minutes before rinsing it out. Lastly, the Hair Milk. This is where you are going to get the most of your scent. I say this because when it dries the scent lingers! Yeah! Great smelling hair ALL day long!! 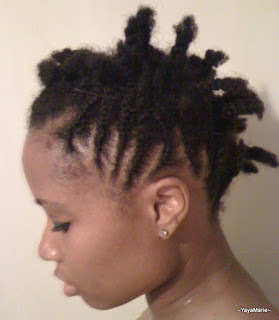 When I got ready to twist my hair, I ran some through my fro and my hair smelled sooo wonderful! It really moisturizes thirsty hair. I use this on a daily basis for my hair. I will say this too. If you order the 16oz of conditioner or hair milk (like I did) you are going to receive 2 8oz bottles. Too bad I don't have anyone to trade with because that would be cool if you had a friend and you could both order different scents and then swap. If you are sensitive to scents you may want to go the unscented route because her scents are mostly oil based, it is not for the sensitive. Everything was neatly packed and she also provided 2 samples of the moisturizing lotion! I received the Cranberry Cocktail and Chamomile Sage. I prefer the Chamomile Sage but the Cranberry Cocktail smells good too. I REALLY want to try the Cocoa Mango scent! That's the perfect summer scent! That's another thing, she has a bar of different scents to chose from! Pick your flavor! I'm going to continue to order from her because I got my order within 3 days of ordering and it was shipped via UPS. Convenient for tracking. I cannot say anything bad about company at all. This is how business should be. I am going to continue to support her business until......you know. Check her out @ karensbodybeautiful.com Make sure you register your e-mail so that you can get the promo's she has! I'm happy!! Thank you Karen.